I watched Bo Burnham’s comedy special “Make Happy” on Netflix for the first time in the fall of my freshman year. In the final song, Burnham emulates Kanye’s famously long and rambling rants from the Yeezus tour. It focuses in on performance and the joys, anxieties, and resulting pain of being on a stage for a living. It’s one of my favorite moments in media, with its deft balance of honest humor and honest pain. Just before he goes into the bit, he segways by warning “if you can live your life without an audience, you should do it.” Eighth Grade returns to this idea, and with clever writing, outstanding performances, and unbelievably detailed imagery. This movie could not have existed 20 years ago. In fact, this movie would have struggled to exist when I was an eighth grader just seven years ago. With the difficulty of casting all young actors, the seeming lack of an audience, a completely untested director:,this is not an easy movie to pitch. 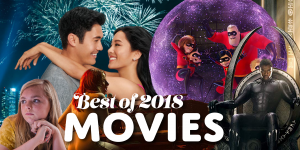 As production companies specialize and movies find new life on different platforms outside of the theatre, risks are being taken on movies that seem more niche than they are. 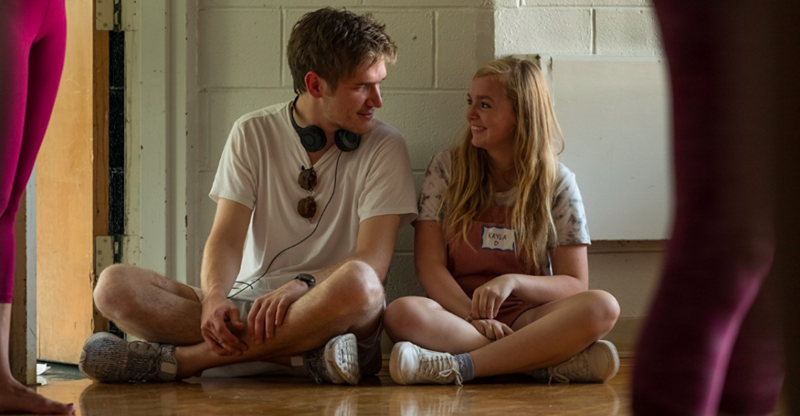 We are lucky that the industry is changing right in front of us, because that evolution is bringing us films we would’ve never seen otherwise, films as insightful, honest, and important as Bo Burnham’s Eighth Grade. Centering on Kayla, played by an amazingly talented, sympathetic, and effective Elsie Fisher, we watch as a young girl muddles her way through junior high life in a world that doesn’t just expect her to figure out who she is, but pressures her to broadcast that self-discovery to everyone she knows in real time. This (both internally and externally) forced performance takes its toll on Kayla. Her anxiety is palpable, relatable, and excruciating. There is no escape for the viewer, just as there is no escape for Kayla, as cringe inducing event after squirm urging moment bombards the screen. With dialogue characterized by constant filler words, unapologetically awkward silences, and referential (but universally understandable) humor, Burnham expertly encapsulates the language of the teenager. It’s never overly dramatic or romantic or clichéd—instead, it’s honest to its core. From the moments in the auditorium where an unseen child interrupts the speaker with a perfectly timed “Lebron Jaaaames” to Kayla’s endearingly rambling Youtube musings, there is never a moment of this movie that talks down to its characters. They are not reduced or typified by their age. Burnham, instead, develops the kinds of characters you knew when you were thirteen. “Types” that still somehow manage to exist as their own nuanced and fully realized characters: not the jock, but the popular, skinny boy in the Steph Curry jersey, not the nerd, but the kid who wears goggles and a swim shirt to the pool party. Details like this are where Eighth Grade shines brightest. The corkboard that is still adorned with paper four leaf clovers in May. The principal who has clearly written out this speech on notecards he left in his office. The tarnish on the trumpet bell that just screams “I’ve belonged to this school for way too long.” It’s all real, and we all know it because we all lived it. Stories about teenagers typically go one of two ways: (1) they deal in tropes as currency and rely on nostalgia and status quo to pull in numbers, or (2) there’s some spectacular conflict in order to offer legitimacy to the normal issues teens face that popular art has largely decided, for some reason, can’t stand on their own two legs. The teens are either locked in a battle between the jocks and the nerds, or there has to be an alien invasion or a post-apocalyptic world or a dying friend just to make the issues matter. This has always disappointed me. Teenagers are uniquely positioned to care about things the world eventually convinces you aren’t important enough to care about. They focus on personal relationships and identity and fandoms and “can I go out next Friday” and clubs and movies like they are the end of the world and the beginning of the world and everything inbetween. Maybe they are. Maybe they aren’t. That’s not what’s important to Burnham. Instead, Burnham locks into an average story about an average teen and uses her average experience to force adults to examine things like anxiety, the Internet, and identity through the lens of someone who allows themselves to care like it matters. Burnham uses an honest teen narrative to force perspective on the adults watching, allowing them the space to care about nebulous things again in a way that’s typically discouraged. Watching a film about a 34-year-old man with anxiety issues might be interesting, but watching a 13-year-old girl struggle to come to terms with her day-to-day anxieties allows me to relate, and through that, take stock of the anxieties in my life now. Eighth Grade is what teen movies have the potential to be: piercing, focused, and unavoidably affecting. Saturated with lonely but hopeful monologues delivered by Kayla into her laptop camera, and what would otherwise maybe be an unnatural number of montage sequences, Eighth Grade captures the internet age in a way that few pieces of media have. It’s a time of extreme self-expression and, therefore, a time of extreme self-consciousness. Our lives are documented and edited and uploaded. We shape our histories in real time. We broadcast ourselves and therefore have to decide what of ourselves we want to broadcast. We capture and manipulate memory for our benefit. My parents never had to consider “is it dishonest to delete the photos of me with my ex on Facebook” or “when is it okay for me to change my relationship status” or “I wonder if they’ll see that I watched their story,” but I’ve had to think about these things all through my teenage years. Burnham captures this moment in time, its pressures and exhilarations, its freedoms and fear, and above all else, its lack of an escape route, without ever oversimplifying the issue or the any of the characters living through it. What audience are you performing for? Have you ever considered how you might feel if you just stopped?